All the latest Adventure Island NES cheats, game genie and action replay codes for Adventure Island on the NES are here in this article. 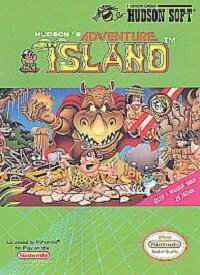 The Adventure Island game on the NES / Nintendo Entertainment System is a very challenging game and can be quite frustrating at times, Hopefully using the below cheats and codes will help you to bACeat this game. If you use these cheats or know of any cheats or codes I have left out please let me know about it by posting a comment below. Level Select – Press Reset on the title screen. Then wait until the title screen appears again and press Right, Left, Right, Left, A, B, A then B. This cheat can also be achieved by pressing Down, Up, Left, Right, B, A, B then A at the title screen. Boss Preview – Press START as a world boss retreats to get a preview of the next world’s boss. Unlimited Continues – At the end of the first stage (right before the G sign), jump up at the edge of the cliff and look for an egg. This egg contains a Hudson Bee, which allows for unlimited continues. At any point where you’ve lost all of your lives, hit any direction on the D-pad, and press START to continue. Keep Weapons When the Game Ends – In the third area of the first island, after you pass the frog, climb up the ledge and drop down on the other side. When you land there, jump and an egg will be revealed. Hit the egg and a key will appear. Retrieve the key, and a platform will appear under you and take you to a secret room. Here a dragon will give you the Hudson Bee, which will allow you to keep all of your hammers and dinosaurs if you die. If you are lucky enough to own an action replay you can use the below codes in Adventure Island NES cheats on the NES. If you are lucky enough to own a Game Genie you can use the below codes in Adventure Island NES cheats on the NES. If any of the codes do not work, or if you know of any that do work that I did not mention please post about it in a comment below. PEEEZIAA Weird . . . Hudson can moonwalk! If you are playing Adventure Island on Emulator (Or another NES emulator which supports cheat codes) there are a ton of cheat codes you can use. You can basically use any of the codes listed under the Action replay codes + Game Genie Codes sections, you simply need to enter the required code as per below. Question : Can I use all of these Adventure Island NES cheats NES Cheats? Answer : The cheats I have listed under “Normal Adventure Island cheats (NES) Cheats” can be used by everyone. You will need a Action Replay or Game Genie to use the cheats listed on this page. Question : Do the Adventure Island NES cheats Cheat Codes Only Work In The Emulator Emulator? Question : I know a good cheat for Adventure Island NES cheats that is no listed on this page, Can you add it. Question : Do you have any gameshark pro codes for Adventure Island NES cheats? I hope this article on Adventure Island Cheats + Action Replay / Game Genie Codes has helped you. If you are aware of any tips I have missed off please post about them in a comment below. Please help us out by spreading the word and sharing this article on Adventure Island NES cheats (NES) Cheats + Action Replay below.